Change can come in many forms and I used to be afraid to embrace what change had to offer - whether good or bad. When I first set out on this blogging journey almost 5 years ago, I often wondered who would read this stuff? I had to first embrace the change I was going through and face those changes with confidence. I did of course what was comfortable for me; and that was writing. Digging up old writings, embracing new content and some of my writing content would pop into my head. Letting it flow was key for me and also not trying to be someone else or write like anyone and to just be me. This is part of the reason why and how A Life With A View was born. We are now two books in and several blog posts into this journey. The first book, A Life With A View released in January 2015 focused on faith, love, happiness and friendship and it is a collection of my early writings and blog posts. The second book, Inspiring Creative Passion released in September 2017 is a deeper dive into faith, love, happiness and friendship and also focuses more on self-care and inspiration. What else is A Life With A View? Well, we are a movement, a safe space for readers to connect with people who want and need to hear positive words and affirmations to get them through every day life. We also have a Shop which has the books as well as t-shirts, mugs, and pens to inspire your journey. This all began with a blog over on another platform and we eventually outgrew the old platform and moved to something more dynamic. I am so excited to have you along and I hope you continue to take a look around and check out what A Life With A View has to offer. This is not only a blog, book, or a shop – but also a portal for joining some great discussions on inspirational topics as well as a little inspiration delivered right to your Inbox. For the first three years in this space, I would blog a little here and a little there and then I dabbled in some other things. 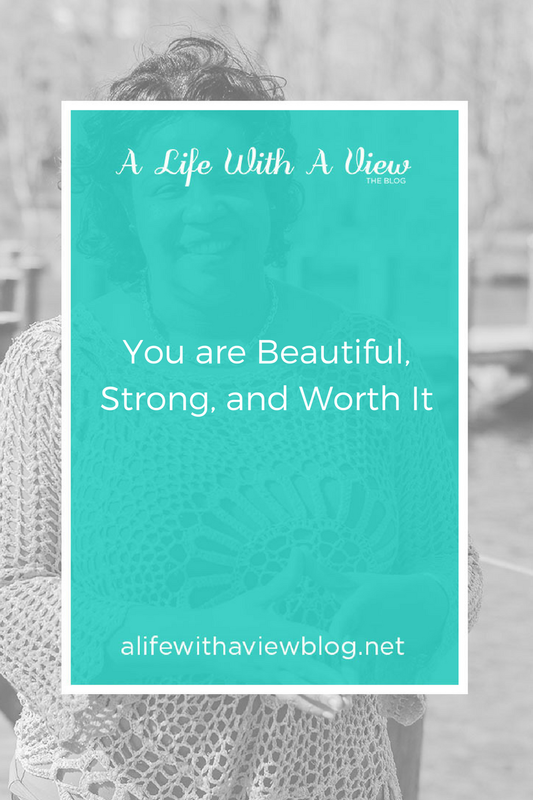 When A Life With A View the book was born, I began to take change more seriously and I wanted to share more - even beyond what I was sharing with my audience in weekly social media posts. I have had this itch and the urge to do more; being more personal with my readers and connect with people who are doing similar things and making a great impact. This all spells Change. I was so afraid at first. Afraid of putting myself out there. Afraid of not being heard or liked. Afraid of not being accepted. I was fearful of what people would think and did I say “putting myself out there” already? Oh yes, I certainly did. Over the last two years I have joined several writing groups and connected with people who are making an impact in their writing and in their every day lives. Initially I had a ways to go to become consistent and get familiar with the tools and resources in people, social media and most importantly, reading. The last two Summers, I signed up and attended online Webinars, participated in Writing Challenges and in-person events and I completed a writing challenge for my readers where I encouraged the participants to tap into their creative energy and find their creative spark. I hope you stay around a while and check things out! Let’s get connected and don’t forget to subscribe and join the discussions right here on the blog. Have an idea? Is there anything you want to see from A Life With A View? Connect with me via email and through my social media outlets. I would love to hear from you! Thank you for being a part of A Life With A View! Love strong; Love with confidence; LOVE YOU! Last, but not least - love yourself always and continue to love strong and with confidence. I say last but not least since I feel I have saved the best for last since love is the foundation for all things. A lot of times we blame love for the best and worst of things which happen in life. Sometimes it is warranted and other times, not so much. With love being the foundation, I thought it very appropriate to have love round out our Inspiring Creative Passion writing challenge! Yes, a week late but we are still here or should I say I am still here. You may be ahead of me since I had a slight setback falling ill leading up to the last week in December 2017. Imagine that - all the excitement and me getting sick. I think it was time for me to slow down and show myself a little love. When I think about love, I think about it as the foundation to everything in life. Without love, we would not be here and I could not do what I love to do - helping others, writing, inspiring myself and others to be their very best. There was a point in my life where love escaped me, disappointed me - so I thought. I blamed love for everything that was going on in my life a few years ago. I loved too hard, too strong, too weak - I said all of those things to myself. The mistakes I made I blamed them on love and me not facing and seeing things as they were. I learned to stop discounting love; running from it and I realized that love was not always pretty. We have to sometimes do things out of love which may not be popular in everyone else's eyes. This is the strong part of love - sticking with your stance when it comes to deciding what is best for you. Loving with confidence comes from within and takes time to build especially when you feel afraid to make decisions which benefit you the most. I know all too well about this. How did I overcome this? Well, it is still a work in progress - loving with confidence but it started with loving myself. You can love strong and love with confidence but if you do not love yourself, you will not get very far. I know first hand and the first thing I had to do was to dig deep to see what made me happy first. Did I want to continue in a relationship where I was not being loved? What about a job or a career which felt overwhelming or unfulfilled? I had more questions than answers when it came to loving myself. One thing I knew for sure was that change was needed and it needed to come quickly. Number 3 was very hard at first. The interesting thing is once I started showing love and putting the positive vibes out there with love as the forefront, I saw my life change in positive ways. I no longer felt sorry for myself and bad about situations which did not work out. Maybe it wasn't meant to be and that is ok. I have enjoyed loving strong and more confidently and most of all, loving myself. I talk more about love as a foundation which keeps you whole in my book, Inspiring Creative Passion. Learn more about the Inspiring Creative Passion movement and click the button below to purchase.